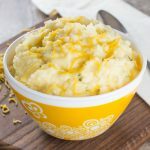 This Keto Garlic and Cheddar Cauliflower Mash is a healthy, low carb, keto alternative. Everyone will surely enjoy this smooth textured and delicious mash. Place cauliflower, garlic, and bay leaf in a pot; pour in enough water to cover. Bring mixture to a boil and cook until cauliflower is tender, about 20 minutes. Drain and discard bay leaf. Transfer cauliflower and garlic to a blender; add Cheddar cheese, butter, and sour cream. Blend mixture until desired consistency is reached; season with salt and pepper.